The Nigerian city Jos, the capital of the Plateau State, is the scene of some of the worst sectarian violence in recent years. Up to 300 people were killed after a disputed local election on Friday which has divided the town on social and religious fault lines. Police have imposed a 24-hour curfew and the army is patrolling the streets. Residents delivered more bodies to the main mosque in the central Nigerian city of Jos on Sunday, bringing the death toll from two days of clashes between Muslim and Christian gangs to around 400 people. Rival ethnic and religious mobs have burned homes, shops, mosques and churches in fighting triggered by a disputed local election in a city at the crossroads of Nigeria’s Muslim north and Christian south. It is the country’s worst unrest for years. Murtala Sani Hashim, who has been registering the dead as they are brought to the city’s main mosque, told Reuters he had listed 367 bodies and more were arriving. Ten corpses wrapped in blankets, two of them infants, lay behind him. A doctor at one of the city’s main hospitals said he had received 25 corpses and 154 injured since the unrest began. “Gunshot wounds, machete injuries, those are the two main types,” Dr Aboi Madaki, director of clinical services at Jos University Teaching Hospital, told Reuters. The overall toll was expected to be higher, with some victims already buried and others taken to other clinics. The violence appeared to die down on Sunday. Soldiers patrolled on foot and in jeeps to enforce a 24-hour curfew imposed on the worst-hit areas. People who ventured out walked with their hands in the air to show they were unarmed. “They are still picking up dead bodies outside. Some areas were not reachable until now,” said Al Mansur, a 53-year-old farmer who said all the homes around his had been razed. Overturned and burnt-out vehicles littered the streets while several churches, a block of houses and an Islamic school in one neighbourhood were gutted by fire. The Red Cross said around 7,000 people had fled their homes and were sheltering in government buildings, an army barracks and religious centres. A senior police official said five neighbourhoods had been hit by unrest and 523 people detained. For some of the backstory on violence and civil conflict in Plateau State, this 2004 article on OCHA’s IRIN website is worth a look. While the rest of the world’s attention was focused on New York in early September 2001, the city of Jos was consumed by a week of bloodletting in which 1,000 people died. But as the article notes, that was just the beginning: over the following 32 months, 53,787 people died in retaliatory violence between Plateau state’s Christians (who are mainly indigenous farmers) and Muslims (mainly traders and livestock herders). 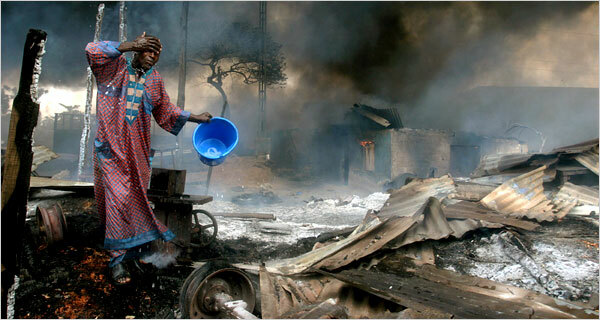 This entry was posted in Africa, Conflict and security and tagged Nigeria, violence by Charlie Edwards. Bookmark the permalink.